When you go to the woodworking store, or to the hardware store, there are a lot of options for buying glue. 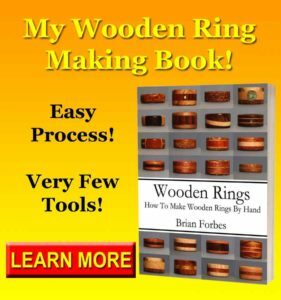 This is mostly marketing, and you really only need a couple types of glue to make wooden rings. Stick with me and I’ll tell you the only two you need. Most rings are made from wood lamination. This means more than one layer of wood glued together to form a blank. You then drill the blank in several places, creating mini ring blanks with different finger openings. Finally, you saw and shape them into rings. Everyone focuses so much on the end steps, that they can forget how important the first steps are. When gluing your blank, it’s important to use a glue that will last, and the ring type makes a difference. For all of your wood to wood joints, wood glue is your best option, but not just any wood glue of course. Cheap, poorly made wood glue will perform like cheap, poorly made wood glue. Over time the glue will break down, the pieces can creep, and the ring can start to look really bad. Instead of risking this fate to some cheap bargain glue, get a name brand woodworking glue with a long track record. For many, this go-to glue brand is Titebond. This name has been around for a long time, and they have a proven record of success. If you want to save money, you can follow my directions for saving money on wood glue, which is the only way I recommend cutting costs on your glue. This brand has been very faithful to a lot of woodworkers, and even if you don’t get Titebond, get a name brand that has a record of trust. There are times when you need to glue something together in your lamination that is not made from wood. In cases like this, the go-to product is two part epoxy. The process is a little more involved than regular glue, but the bond is incredible. When it comes to gluing anything to nearly anything else, the first adhesive that you think of should be two part epoxy. I recommend that you use a 5 minute and a 60 minute, depending on how much time you need to get it in place. The gluing process is largely the same as when working with wood, but you use the epoxy and your other materials instead. Make sure to clamp well, wipe off the excess, and treat it about the same as any other glue joint. Leave it for 24 hours, and you can handle the joint in most cases. For more about epoxy, my Woodworking Tips Card on Epoxy is a quick read. For the beginner, and even for some of the advanced woodworkers, there are just far too many choice for things. Glue is no exception, and there are different glues that can be found for nearly every application. This is more about marketing than anything else. People would rather buy something that ensures their success, even if it’s more money. The idea being that a specific glue ensures your success is debatable, but having a dedicated product makes people feel better. In reality, you could package wood glue in a number of different skins for different applications and call it a specialty glue. The truth of the matter is that it’s the same glue, doing the same job in the end. You really don’t need as many choices as there are in the marketplace for adhesives, especially on something as simple as a wooden ring. If you have never bought glue before, then you might not know a lot about what glues are more stable than others. One easy way to look is to check out their website. Pick out a few glue names and look at the website, and the company information. Here is where you will find out a lot about the place you are buying from. Start with the about page, and look at the age of the company. Have they been making glue for a long time? Do they make everything in the world or do they just make glue? Look at these clues and evaluate the company. Then, do the same thing for another company. Do this for a couple places, and then look online for some reviews and see what real woodworkers are saying about the product. Odds are that there are a number of great sources that will be happy to tell you the good and the bad. If you are really struggling, you can’t go wrong with Titebond for your wood glue, and I really like using the Lock-Tite brand of two part epoxy. I use both of these in nearly all of my projects, and neither brand has failed me yet. 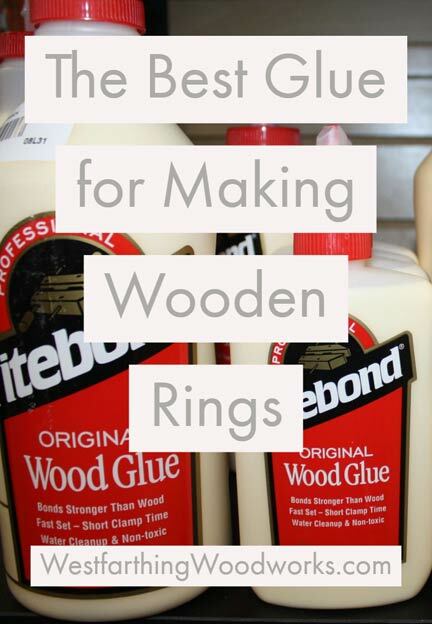 See Also: 9 Ways to Make a Better Wooden Ring for more ring making ideas. If you have not bought glue yet, or you are using really cheap no-name glue, it’s time to get something different. Head over to the woodworking store and see what they have to say about their wood glue selection if you don’t want to do the research yourself. When you are there, let them know what you are planning on gluing together, and they can point you in the right direction. In a regular woodworking store, you have a better chance that the products they carry are made by the right companies. You will probably not notice a huge change in the way you glue things, but what you can take to the bank is confidence. With a trusted glue, you can be more confident. Know that your pieces will not fall apart due to a poor glue choice, and feel better about your laminations. There are a lot of choices for glue in the beginning when you are making wooden rings, but you really only need two kinds. The rest of the glues are specialty glues, and they are meant for really specific situations. Wooden rings are pretty easy, so you only need two. Wood glue is the best for any wood to wood joints. Select a good name brand that you trust and that has a long track record. For the other glue, a two part epoxy is perfect for your non wood joints. Again, pick up a good name brand. Finally, the choice you make for glue is not going to make a huge impact on the day that you glue the pieces together. What it really does is gives you peace of mind down the road knowing that your pieces will not fall apart. It would be a shame for your project to fall apart for no other reason than cheap glue, and for a few dollars you can prevent that.